Everyone loves cookies! Drop by the shelter on Dec 9th from 9am – 1pm to pick up some homemade goodies that our generous volunteers have baked. There will be plenty of volunteers to take you on a tour of the shelter too! All proceeds go to helping the animals at the shelter. 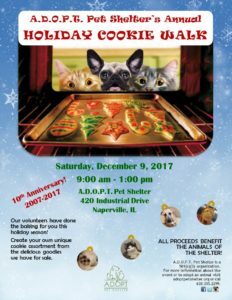 Don’t miss out on the Cookie Walk’s 10th Anniversary! This Cookie Walk will be even more special than usual, and the hours have been extended until 3 pm. There will be a cookie decorating station for the little ones. Our bakers send in extraordinary home made goodness.